Massage is not just a luxury it’s a way to a happier and healthier life. Thai Massage combines the an cient disciplines of acupressure, ayurveda, reflexology and asana yoga. It involves the manipulation of energy sen body lines through a process of rhythmic and deep tissue massage achieved via thumbing and palming on the limbs, creating harmonics in the body, yogic stretching and gentle body manipulation. Jaqui’s interest in Thai massage came about from practising Asthanga Vinyasa and completing an Ashtanga Adjustment’s course with Abby Daniel. In 2006, she completed her Thai yoga massage diploma with Andrea Baglioni a member of the Sunshine Network. She continued her studies in 2008 with Nerve Touch School in Chang Mai Thailand and there she was introduced to the Thai Massage Circus. Jaqui is a fully registered member of the Complementary Therapists Association. 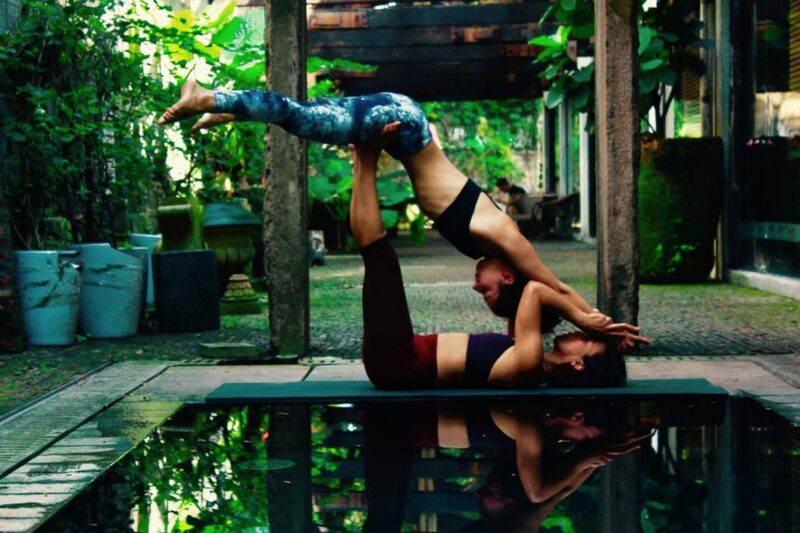 This practice draws influence from AcroYoga and its therapeutic flying practices. It involves yogic stretching of the limbs and trunk; manipulating the body and its energy lines along the torso, particularly the spine, by actively encouraging the flow of energy upwards towards the crown of the head. Flying therapeutics is both unique and stimulating. The therapy is applied while the patient is suspended in the air, allowing the practitioner to work with the weight bearing gravity of the flyer to lengthen and clear blockages, stiffness and tightness creating space and better energy flow. All treatments given are suitable for clients of all ages and abilities and is varied enough to cater for a wide range of physical needs. suffer from a severe eye or ear conditions. All bodywork sessions can last for any duration between one to two hours. Prices are negotiable, concessions available and discounts for bulk bookings. All treatments are carried out fully clothed on a futon style mattress. It is advised that you should not to eat a heavy meal (minimum two hours) or drink alcohol before your treatment. For more information please contact me via email here.